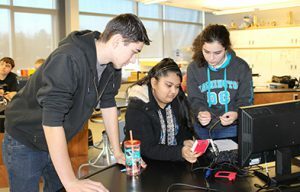 Students Austin Case of Greenville, left, Nikki Begum of Hudson, center and Fiona Haggerty of Greenville collaborate to wire a Raspberry Pi computer during Hour of Code activities on Friday, Dec. 9. Tech Valley High School’s computer science program will expand in partnership with the University at Albany thanks to a grant from the Bender Scientific Fund of the Community Foundation of the Greater Capital Region. This $8,500 grant will support the second year of TVHS’ computer science course, and support a research project with University at Albany to further develop the new project-based curriculum. The funding will allow for the purchase of course supplies for 15 additional students, including Finch robots, Pi peripherals, textbooks and hardware to build computers. The grant will also support a research component by the University at Albany’s Reza Feyzi Behnagh, who will study the efficacy of the new course and provide professional development and support for creation of project-based learning curricula. Girls and students with special education designation, who are underrepresented in computer science courses, will be surveyed and incentivized to participate in the survey. TVHS introduced its computer science program with an elective course for the current school year in partnership with Siena College under the grant-funded Siena Plan for Attracting and Retaining Computer Scientists (SPARCS). The program focuses on recruiting and retaining computing majors in high school and the first two years of college. Niedermeier said the goal is to make an introductory computer science course a requirement for all TVHS students in the 2017-18 school year.